Copyright © 2015 Practical Devices Corporation. All rights reserved. Attention: FREE STUFF! We here at Practical Devices are very happy to have finally released the XM6. FREE: Color choice of black or blue (normally +$18 USD). Important: This offer will expire very soon without notice! The XM6 is the most feature-packed portable headphone amplifier on the market today. Strong, clean, unsurpassed sound quality is made possible by the XM6's two-chip ultra-low-distortion FET amplification stage, mated to a separate two-chip output buffering stage, all in a monoblock configuration. All chips use gold-plated sockets, which allow for easy upgrading/rolling to configure the sound to exactly your taste. This attention to detail adds up to audio performance with an SNR well in excess of 100dB, and near-zero distortion (We are one of the few manufacturers who actually publish quantitative audio test results of our amplifiers. Test results here). The XM6's USB-DAC stage is equipped with Texas Instruments' SRC4192 digital upconverter, feeding the legendary Wolfson Micro WM874x-series DAC (your choice of WM8740, WM8741, or WM8742), operating with 24-bit resolution at a 192kHz sampling rate. The result is absolutely unrivalled USB audio quality. The XM6's features leave other amps far behind: there are controls for bass, treble, and gain boosts, and a control to enable/disable 75Ω output impedance (for those of you with lower-impedance headphones and IEMs). The XM6 also has Practical Devices' patent-is-pending Active Variable CrossFeed, which is simply not available on any other brand of amplifier. There is also a rear panel LineOut aux connector, and a first for any portable USB DAC: a multimedia controller joystick. And finally, the XM6 has intelligent microprocessor control, a 1-hour no-fuss Lithium-Ion FastCharge® battery system, auto power-off, and a low-battery indicator. Lastly, the XM6 simply looks and feels spectacular. Available in your choice of color, the XM6 has robust, all-aluminum construction. It just looks, sounds, and feels spectacular. And all backed by an industry-leading 3-year warranty and no-hassles 30-day money-back satisfaction guarantee. and lots lots more. No other portable has all this in one package. User's Manual (pdf): Click here. Why Buy? Click here. For a limited time with every XM6 purchase we are including our high-quality gold-plated interconnect cable (picture here). No other portable amp has all this. We have packed an incredible amount into the XM5. Strong, clean, unsurpassed sound quality is made possible by the XM5's two-chip ultra-low-distortion FET amplification stage, mated to a separate two-chip output buffering stage, all in a monoblock configuration. All chips use gold-plated sockets, which allow for easy upgrading/rolling to configure the sound to exactly your taste. This attention to detail adds up to audio performance with an SNR well in excess of 100dB, and near-zero distortion (We are one of the few manufacturers who actually publish quantitative audio test results of our amps. Test results here). The XM5 comes equipped with the well-respected PCM2704 USB DAC, which is the best-performing USB DAC available from Texas Instruments, with 44.1 / 48kHz sampling rate, oversampling digital and analog filters, and multibit noise shaping. The DAC is natively supported by Windows 7, XP, Vista, MAC OS 9 and OS X, and most Linux distributions. 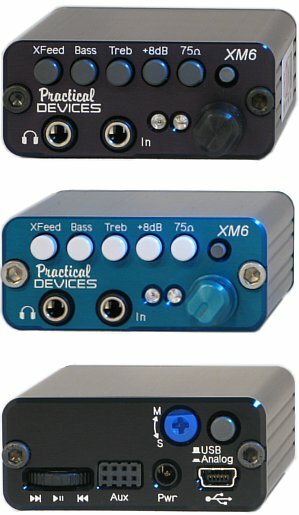 The XM5's features leave other amps far behind: there are controls for bass, treble, and gain boosts, and a control to enable/disable 75Ω output impedance (for those of you with lower-impedance headphones). The XM5 also has Practical Devices' patent-is-pending Active Variable CrossFeed, which is simply not available on any other amplifier. And finally, the XM5 has intelligent microprocessor control, which allows for a 1-hour no-fuss Lithium-Ion FastCharge® battery system, auto power-off, and a low-battery indicator. Lastly, the XM5 simply looks and feels spectacular. Available in your choice of silver or black, the XM5 has a robust anodized aluminum case and glossy laser-anodized faceplate. It just looks, sounds, and feels spectacular. And all backed by our 2-year warranty and no-hassles 30-day money-back satisfaction guarantee. More XM5 Details: Click here. For a limited time with every XM5 purchase we are including our high-quality gold-plated interconnect cable (picture here). 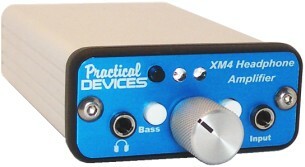 Practical Devices Corporation is pleased to release the XM4 Portable Headphone Amplifier. We've worked very hard to provide you with what may be one of the most advanced, feature-packed, and best-sounding portable headphone amps on the market today. The XM4 is designed to be durable, flexible, easy to use, practical, and above all, sound great. Each unit is carefully manufactured, and the rigorously tested for performance, durability, and sound quality. And we are one of the few manufacturers who actually publish quantitative audio test results of our amps (click here.). The XM4 delivers crystal-clean sound quality, packed with a combination of useful features not found on other amps. The robust anodized aluminum case and glossy laser-anodized faceplate combine to make the XM4 an striking sight to behold. The impressive engineering continues on the inside, where such things as military-precision resistors, oversized electrolytic and tantalum capacitors, and an ultra-low distortion FET amplifier chip contribute to the XM4's outstanding audio performance. Finally, the XM4's intelligent microprocessor control gives you an extraordinary set of features, including auto power-off, an internal battery charger (an optional Lithium-Ion system is available), variable crossfeed, and Bass Boost with bypass. More XM4 Details: Click here. All I can say is WOW!!! I AM SOLD ON THIS! Item better than described! THANX! Audiophile quality at a great price. This is no average amp. I didn't think my Sennheiser HD-595's could sound any better; how wrong I was. This headphone amp brought my Sennheiser 560II's back to life. Thanks! Wow! This amp is great! Best deal on the net. Thanks! Buy one. This amp is PHENOMENAL - Strong and detailed; Useful features too. This thing ROCKS! Great sound. Beautiful amp. Speedy delivery. Thanks! This headphone amp blows away my Shellbrook amp! Bravo! Great amp. Great sound. Incredible price.